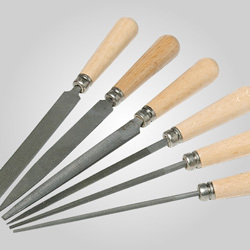 Economical, versatile tools that accommodate 1/4", 1/2" or 3/4" wide abrasive belts, for sanding and smoothing hard-to-reach areas. Made of impact-resistant polypropylene. 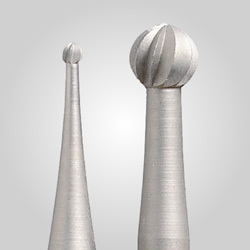 The tip can be easily reshaped to meet your exact needs. 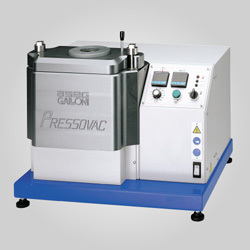 A spring-loaded tensioning device allows the abrasive belt to be rotated so that all areas of the belt can be used and permits quick belt changing. Belt Sticks may be used dry or with water, oil, or solvents. Both sticks and belts are color-coded to help you quickly distinguish one grit from another. Abrasive belts are resin-bonded, cloth-backed aluminum oxide. Supplied with 5 Belt Sticks: 1 each of red (120 grit), blue (240 grit), green (320 grit), yellow (400 grit), and black (600 grit) with 1 abrasive belt of each grit (120, 240, 320, 400, and 600). Includes 3 Belt Sticks with 1 belt each: red (120 grit), blue (240 grit), and green (320 grit) plus 15 additional belts (5 each of 120, 240, and 320 grits). Supplied with 3 Belt Sticks with 1 belt each: red (120 grit), blue (240 grit), and green (320 grit). Thirty additional abrasive belts included (10 of each grit: 120, 240 and 320). 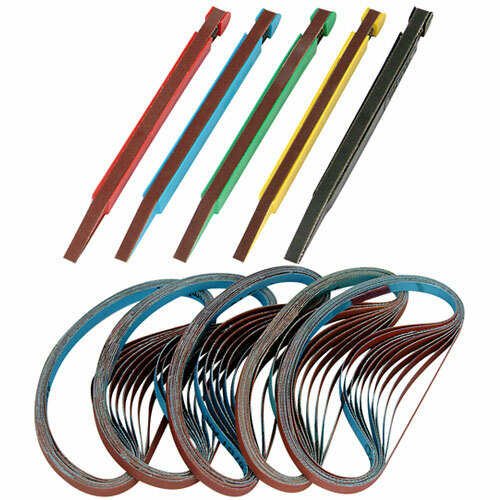 60-Piece Set — in your choice of 1/4", 1/2" or 3/4"
Supplied with 5 Belt Sticks: red, blue, green, yellow and black (each with one abrasive belt). 50 additional abrasive belts included (10 of each grit: 120, 240, 320, 400 and 600).